Your mission, should you choose to accept it, is to consider for a moment the unlikely journey of the Mission: Impossible franchise. Born from the 1990’s odd partiality toward remaking 1960’s television series (see The Brady Bunch Movie, The Beverly Hillbillies, and The Addams Family). Mission: Impossible began as a Brian De Palma-directed pop-culture juggernaut based on a – and let’s be honest here – a rigidly-formatted television series that peaked in its second season and went through the motions for another five years. Other than maintaining the general action trope of surviving the ticking timebomb/crisis of the moment, De Palma’s film sounded right (U2’s Larry Mullen and Adam Clayton refashioned the Lalo Schifrin theme) and kept a few tropes around (self-destructing tapes), but it didn’t care to honor the decidedly un-blockbustery premise of the television show. As a result, members of the original cast, including Greg Morris, Peter Graves and Martin Landau, all publicly panned the film. Deviation from the procedural-heavy TV series, which focused on an interchangeable ensemble of characters, was inevitable. The obvious point I’m trying to make is that an action film requires a series of stunts, chases, fights (of the fist or gun variety), explosions, etc., all the things that make the heart race and palms sweat. Ticking timers attached to Armageddon devices optional, but encouraged. Merely adequate actioners string these elements together so that action beats occur every so many minutes. Boredom, terrorists, anarchists, and megalomaniacs are the enemy. 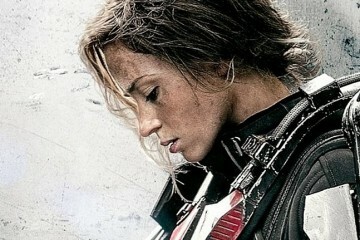 In most summer blockbusters, so too is intelligence and innovation. With the exception of someone like Michael Mann, whose sense of pacing and narrative supersedes the need for regular adrenaline rushes, few mainstream American films of the action persuasion prioritize narrative over spectacle and can systematically build tension in the absence of things that go bang. 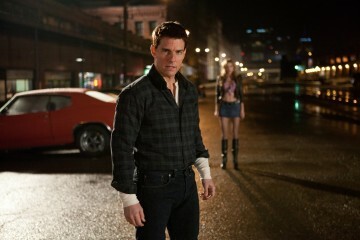 Like EON’s control of James Bond, Tom Cruise has been the consistent creative force shepherding the franchise from its inception in 1996 as a reworking of the 1960’s television series. As both the star and the producer, he put his own skin (and broken bones) in the game. He’s a complicated and controversial face of the franchise, but he’s also, lest we forget, a charismatic salesman of pop culture and the last true International movie star. When Mission: Impossible stumbled (relatively speaking) at the box office with M:I3 (2006), Cruise regrouped and refocused the franchise on the team-based espionage that he’d abandoned at the outset, with a few tweaks. 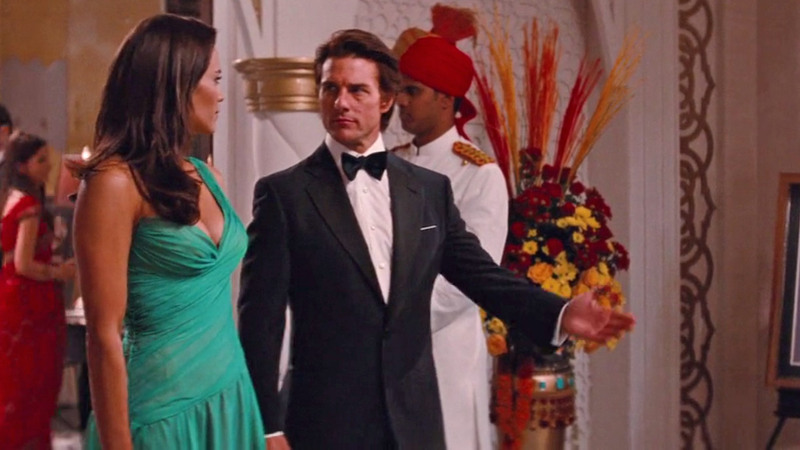 Paula Patton, Paula Patton’s buzzworthy dress and Tom Cruise in Mission: Impossible – Ghost Protocol (2011). Starting with the fourth installment of the franchise, 2011’s Ghost Protocol, Mission: Impossible has (along with John Wick) elevated the action form above mere thrills to stunt-driven poetry – and this as a result of completely reworking the formula and sharing the screen with charismatic co-pilots that the audience now also identifies with the Mission: Impossible franchise. 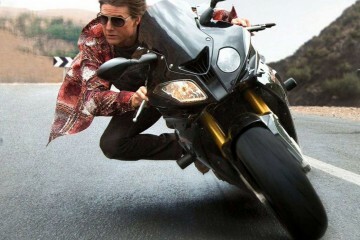 Cruise/Ethan Hunt, of course, remains the superhuman pitchman. 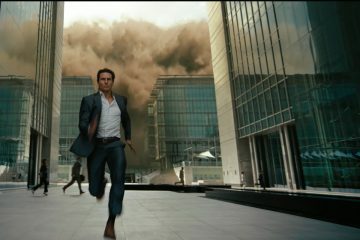 Mission: Impossible – Fallout once again pushes the IMF envelope. Fallout discounts conventions of pacing or moderation by steadily increasing the stakes. Writer and director Christopher McQuarrie heaps crisis on top of crisis until, at one point, the audience can’t help but laugh when further obstacles prevent Ethan Hunt from saving the world from nuclear annihilation. Insert one of the most intense timebomb clocks in the history of cinema. They’re laughing as a release of tension, but they’re also laughing at the lengths to which Fallout goes to make this mission the impossible-est. Fallout’s escalation of tension relents only when the credits roll – its greatest offense might be failing to give the audience a moment to breathe, to release their white-knuckled death grip on the armrest. As a result we’ve lost the opportunity to explore character – other than Ethan Hunt, but more on this in a minute. Suffice to say that no one will likely be disappointed by the car, helicopter, foot, and bike chases offered up in Fallout. You’ll marvel at how Ethan Hunt can part the seas of traffic like Moses… or Neo from the Matrix playing Frogger. You’ll also find yourself considering midway through Fallout whether you’ve ever seen anything built quite like it. Even if Fallout tips its hand regarding the coming post-marital conflict during the first act, the conclusion to this relationship remains largely satisfying and, dare I say, rather emotionally resonant. (Here we go with the melodrama again. How about Written on the Atomic: Fallout by Douglas Sirk?) An action film taking time to explore real emotion in the middle of a nuclear crisis? Inconceivable! Even if it does stop short of revelatory. So Mission: Impossible – Fallout assumes the title of best action movie ever made and all others should just quit making them because this is the one that broke the genre. That’s, perhaps, more complicated. It’s no great stretch to consider Ethan Hunt an extension of the Tom Cruise ego/brand. With so many of Fallout’s characters taking every opportunity to laud Hunt’s character, the filmmakers either didn’t trust his exploits to speak for themselves (they do) or there’s something extratextual at play. After all, no fewer than four characters including Alec Baldwin’s Hunley (current head of the IMF) take time out of teary-eyed, earnest monologues to praise Ethan’s morality. 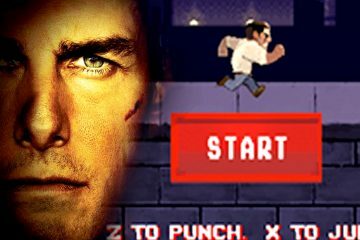 The film celebrates Ethan Hunt’s god complex rather than even considering for a second that he, as a mortal human, has overstepped his bounds as a secret agent. So when Ethan’s ex-wife (Michele Monaghan reprising her role as Julia) finally pops up (with Wes Bentley of all people in tow!) as part of Soloman Lane’s extravagant revenge plot, even she’s complicit in reinforcing Hunt’s moral superiority. 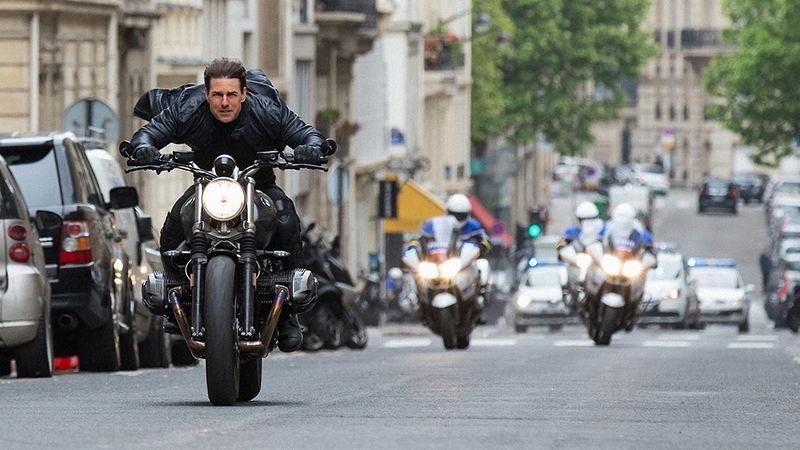 The film wields Hunt’s benevolence to further complicate the narrative, but it also seems to stroke the ego of its producer and star, who, for all intents and purposes, has become his on-screen Ethan Hunt persona. 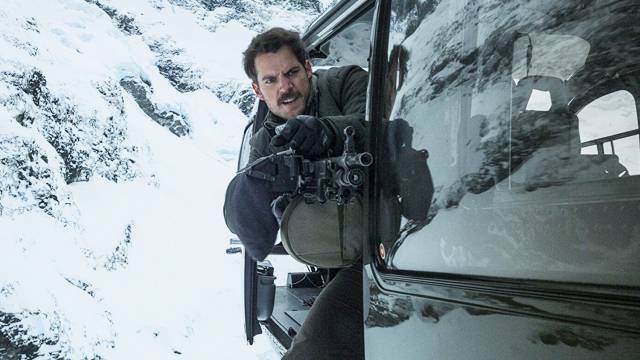 Henry Cavill’s mustache takes aim at Ethan Hunt in MISSION: IMPOSSIBLE – FALLOUT. It’s a blemish, but nevertheless a distracting misstep that could have been avoided with a tighter edit on the screenplay. Chalk it up to ego-stroking or unsubtle filmmaking, either way it’s a ding in the armor of an otherwise raging piece of nonstop action entertainment. Complicating this take on the film, however, is the fact that Cruise has the foresight to surround himself with other scene-stealing performers. It’s these complementary parts that elevate Fallout. Moments like the infamous bathroom brawl (the origin of the already legendary Henry Cavill arm reload) and the final confrontation between Ilsa (Rebecca Ferguson) and Solomon Lane complete Cruise’s vision of the series as a showcase for a large cast of talented actors and personalities. 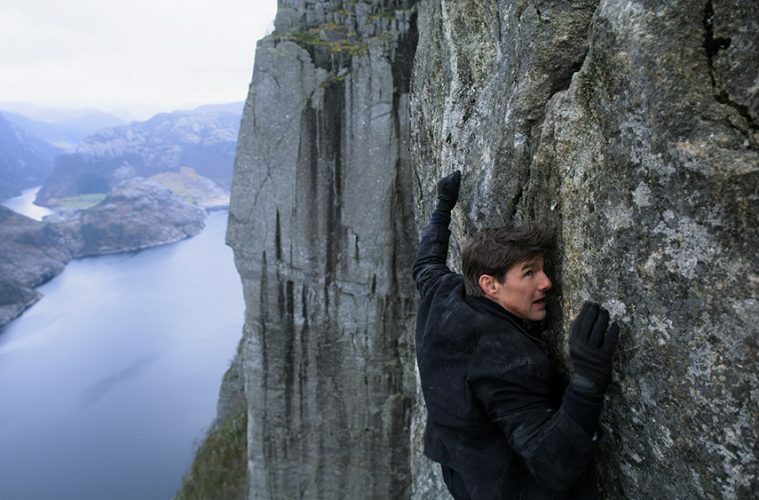 Mission: Impossible – Fallout duly satisfies any viewer’s need for hyperconvoluted intrigue and gonzo stunts. It’s safe to say you’ve probably never seen a Hollywood action movie as big and bananas as this one. And the juggernaut shows no signs of slowing down. 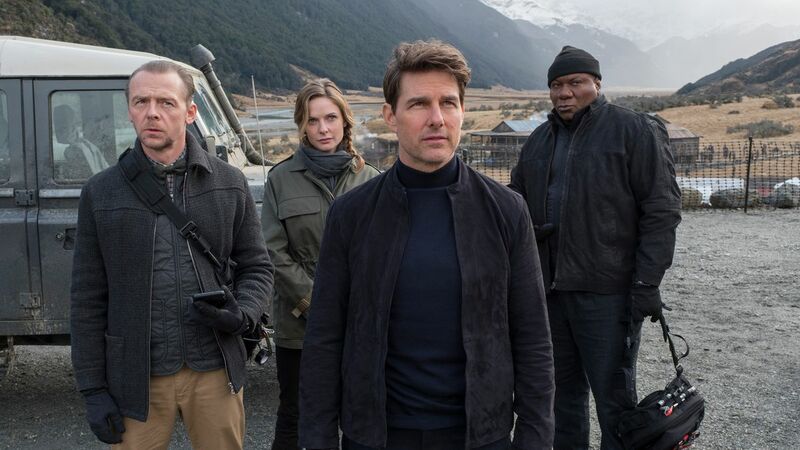 Though Cruise provides the familiarity with his brand, it’s Rebecca Ferguson’s Ilsa Faust that has, of late, most energized the Mission: Impossible template. Her starmaking performance in Rogue Nation has given fans cause to believe in life after Tom Cruise. 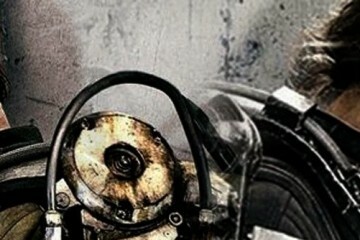 Sooner or later, the 56-year-old star’s mind and body will finally admit to being over 40, and when that happens, the IMF has placed itself in a unique position — a woman could very well assume the face of an action franchise without missing a beat. And that would be the greatest trick Tom Cruise’s supposed ego has ever pulled. 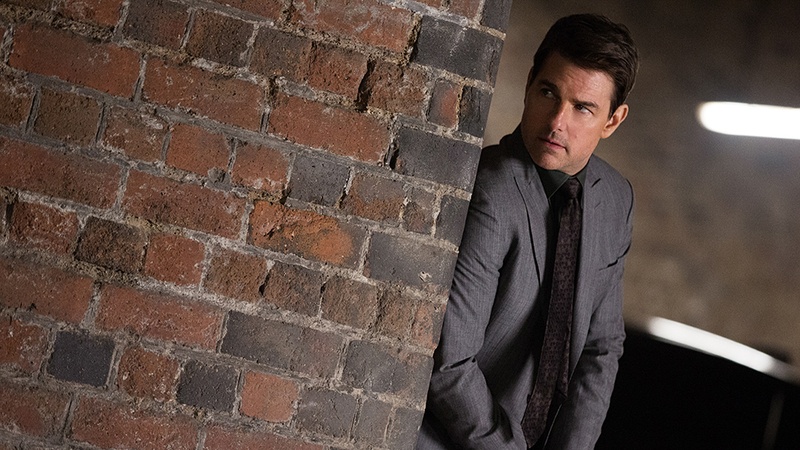 Tom Cruise as Ethan Hunt in MISSION: IMPOSSIBLE – FALLOUT. Previous ArticleTRAILER: DAVE BAUTISTA AIMS TO SETTLE THE "FINAL SCORE"